The big change in the Eagles kicking game last offseason made headlines, but the story largely fell by the wayside as we took in the 2011 Eagles horror show. Time to bring it back. 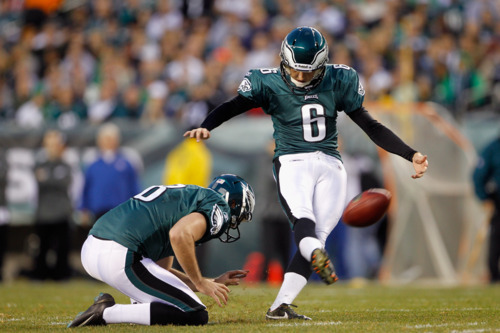 When the Eagles let David Akers go last year, I pegged him as an average kicker at this point in his career. While his accuracy under 50 yards was still good, other kickers had overtaken him in the distance department. Before 2011, Akers had gone five years without making more than 40 percent of his attempts over 50 yards. Just to remain with Akers for a moment, he really enjoyed playing in the warm air of San Francisco. He made more field goals beyond 50 yards than he had in the previous six seasons combined. Oddly, his accuracy from 40-49 yards dropped instead. On the other hand, Henery’s numbers are difficult to judge, if only because he kicked so few field goals. He attempted 27, which was tied for third-fewest in the NFL among kickers playing all 16 games. He also had just six attempts all season beyond 40 yards. Henery did well from that distance, but it was such a small sample size. I’m not completely surprised by his lack of distance attempts. When I attended games in the press box, Henery’s warm-ups suggested his leg needed to get stronger. Practice attempts from 45+ yards were at best a 50-50 shot, and almost always because of distance, not accuracy. Akers became a legend for his 60-yard field goals during practice, and Henery still seems to have a ways to go before Andy Reid can trust him on those longer kicks. Perhaps an offseason in the weight room can help with that. Tagged with Philadelphia Eagles, NFL, Kicking, Kickers, Field Goals, David Akers, Alex Henery, Accuracy, Statistics, Rookie. March 6, 2012 by Brian Solomon.